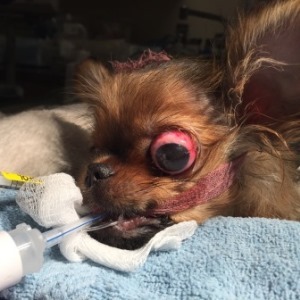 Lee Herold, DVM, DACVECC, describes a traumatic eyeball proptosis (pictures too!) and gives some pearls of wisdom learned from her years of experience. In our everyday lives, it is not unusual to encounter people who are interested in and awed by our jobs as veterinarians. I was once at my physician’s office, and he relayed a story out of curiosity and (I suspect) to ferret out the truth about an urban legend. The story began, as many urban legends do, with the phrase– “A friend of mine…” The tale continued to venture into implausible and horrific territory: “A friend of mine came home one day to find that his French bulldog had one eye hanging out of its socket! He went to the veterinarian’s office where the eye was removed. Can this really happen?” I had to reply in the affirmative. Despite the fact that he was a physician with medical training, he stated how distraught he would be if he came home to find his dog with this condition. As emergency veterinarians, we regularly see patients that have sustained traumatic proptosis and the following is a case example. A 12-month-old intact male Chihuahua was presented for evaluation of proptosis. The owner had not witnessed the trauma; however, they had heard a scuffle and thought that the patient may have had a fight with the household cat. The clients then found the dog with his right eye protruding and presented him for evaluation. On examination, the right eye was proptosed with a miotic pupil. There was no direct or consensual pupillary light reflex. The posterior chamber could not be evaluated due to miosis. The rest of his physical exam was not remarkable. On initial triage, the proptosed globe was lubricated, the patient was given a hydromorphone injection for analgesia, and an e-collar was placed. The options for therapy including reduction of the globe with a temporary tarsorrhaphy or enucleation were discussed with the owner. The prognosis for vision recovery was poor; however, retaining the globe with tarsorrhaphy was an option for cosmetic reasons. The owners authorized enucleation because the follow-up and monitoring for enucleation was less intensive than that required after tarsorrhaphy. The patient had an IV catheter placed and was started on IV fluids for anesthesia. He was induced with ketamine/diazepam, intubated and maintained on isoflurane. An enucleation was performed via subconjunctival approach, with transection of the extraocular muscles and ligation of the optic nerve. The nictitating membrane was also removed. The soft tissues of the orbit were apposed to reduce deadspace in the orbit with simple interrupted and cruciate sutures of 4-0 maxon. The palpebrae were sharply excised and closed in two layers: modified subcuticular closure with 4-0 maxon and skin with simple interrupted sutures of 3-0 dermalon. The patient was discharged with tramadol and amoxicillin. Traumatic proptosis can occur in any breed and in both dogs and cats. However, brachycephalic breeds with large prominent globes are predisposed. 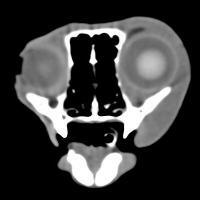 Proptosis does occur in dolichocephalic dogs though they require a greater degree of trauma to achieve proptosis. After a traumatic proptosis, the globe is trapped in front of the eye lids and exposure can result in corneal ulcerations. Prognosis for return of vision with a proptosed globe is poor with only ~20% of eyes regaining some vision. Transection of the optic nerve, proptosis in cats, transection of two or more rectus muscles and the presence of hyphema obscuring the posterior chamber are reported to be associated with a poorer prognosis for return of vision. Therapy for proptosis can include replacement of the globe and temporary tarsorrhaphy, or removal of the globe with enucleation; both procedures require anesthesia. If severe facial or head trauma is present, the ocular procedures may need to be delayed in the interest of cardiovascular stability and management of head trauma. However, if there are no contraindications for anesthesia, then replacement of the globe should be performed as soon as possible to protect the cornea from further trauma and improve the probability for return of some vision. If replacement and tarsorrhaphy are chosen, a flourescein stain should be performed to assess the level of corneal ulceration. Horizontal mattress sutures with stents are often used to perform a temporary tarsorrhaphy. Sutures should be placed in such manner that they are not full thickness, so they do not cause inversion of the eyelid margins. A small gap at the lateral or medial canthus is left to allow administration of topical ophthalmic medications that can include antibiotic ointments/drops and mydriatics. Patients are also discharged home with systemic pain medications and antibiotics. 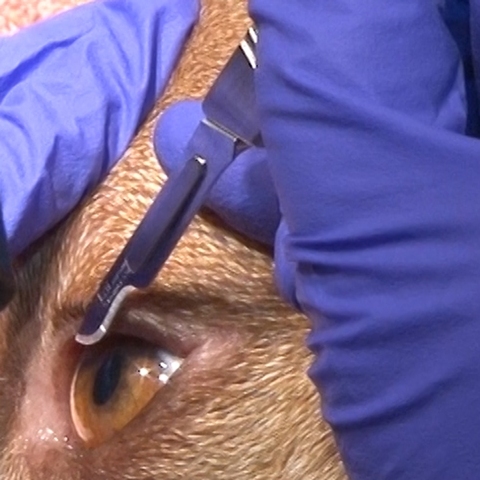 As the swelling from traumatic proptosis decreases, the tarsorrhaphy sutures can start to loosen and therefore impinge on the corneal surface. For this reason, patients with temporary tarsorrhaphy should be re-evaluated regularly and in short intervals in the first week after replacement. The temporary tarsorrhaphy sutures usually stay in place for two weeks or longer. As with most ocular injuries, an e-collar to protect the eye is essential to recovery. Owners should be prepared for possible long-term sequelae of a proptosed globe which can include a blind eye, strabismus, keratoconjunctivitis sicca, lagopthalmos and chronic exposure keratitis. Rarely, glaucoma can develop. The eye can become phthisic and shrunken, reducing the cosmetic appearance of the globe to the owner. Perform a lateral canthotomy, if needed, to expose and remove the globe. Though in practice, I have found that a lateral canthotomy is rarely required to achieve enucleation in traumatic proptosis. Post-op care includes maintaining an e-collar, administration of systemic pain medications and oral antibiotics. The sutures are removed in 10-14 days. Prognosis for return to a normal quality of life is good in dogs after enucleation. Gilger BC, et al. 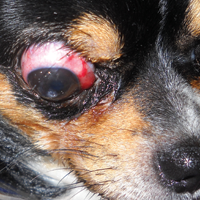 Traumatic ocular proptoses in dogs and cats: 84 cases (1980-1993). J Am Vet Med Assoc. 1995; 206(8): 1186-1190. Gelatt KN. Essentials of Veterinary Opthalmology. Philadelphia: Lippincott, Williams, and Wilkins. 2000. pp. 40-45. Fossum T. Small Animal Surgery 3rd edition. St. Louis: Elsevier. 2011. pp. 267-269. Book BP, et al. Ultrasonographic abnormalities in eyes with traumatic hyphema obscuring intraocular structures: 33 cases (1991-2002). J Vet Emer Crit Care 2008; 18(4): 383-387.